Working with a fiber almost as fine as spider silk is challenging. 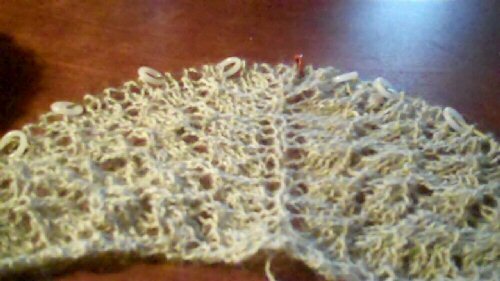 My main project now is the Swallowtail lace shawl worked in a warm grey, Silky Alpaca lace weight by Classic Elite Yarns. It is 70% alpaca and 30% silk. Soft yet substantial in hand it is a luxury to work with it. This shawl is a gift for a friend living in the southern US and will be easy to wear this fall when nights turn a little cooler. I’ve started this pattern in other yarns but tripped over the nupps (pronounced “noops”) in heavier yarns. In crochet they’d be something like a popcorn stitch, but in knitting they are made knitting in the front and back of the same stitch many times to create a solid block. I hope I can do them even in this lace-weight yarn. Staying focused is my problem. Too easy I daydream… then there is a mess. With this fine yarn a mess is a really big mess. Knitting isn’t very forgiving and these patterns demand concentration. I figure it is a good exercise. The alternative is to start taking math courses–and I might do that too. After 10 days there is six inches of fabric. But it is nearly perfect.